Power Mirrors,Vanity Mirrors,Traction Control,Airbag - Driver,Airbag - Passenger,Side Airbags,Roof Airbags,Air Conditioning,AM/FM Radio,12V Power Outlet,Backup Camera,Four Wheel ABS,4-Wheel Disc Brakes,Cruise Control,Rear Defrost,Front Wheel Drive,Vehicle Anti-theft,Remote Keyless Entry,Power Locks,Heated Mirrors,Trip Computer,Power Windows,Intermittent Wipers,Cloth Seats,Fold Down Rear Seat,Front Bucket Seats,Tilt Steering Wheel,Steer Wheel Audio Cntrls,Leather Wrapped Steering,Power Steering,Bluetooth Connection,Compact Spare Tire. Hello, I would like more information about the 2014 Chevrolet Equinox, stock# 24094Q. 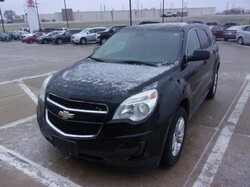 Hello, I would like to see more pictures of the 2014 Chevrolet Equinox, stock# 24094Q.